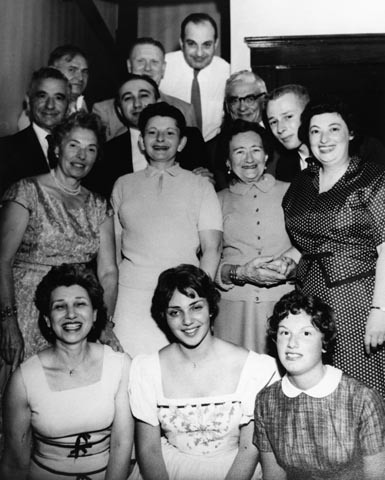 SAMUEL GASS’S BUSINESS PARTNER, Isaac Razin, served as shadchen (matchmaker) and introduced Sam to his niece, Lena Kessel. Lena had been born in 1887 in the town of Kamen Kashirskiy, on the Russian/Polish border. 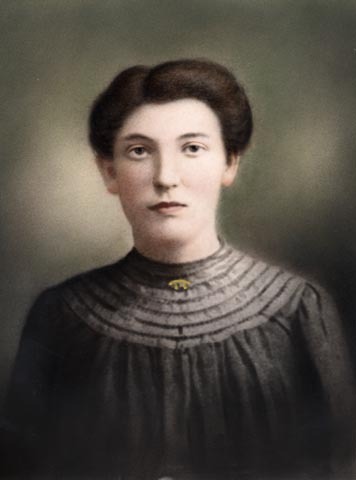 She came to America in 1907 with her father Samuel Kessel, her sister Mary, and brother Harry. Her mother and sister Sarah followed a few years later. Sam and Lena were married on March 23, 1908, in Chelsea, Massachusetts. Compared to Sam who had immigrated in 1903, Lena was a relative greenhorn. During the early years of their marriage, both Samuel and Lena worked hard to bring in money. Samuel was becoming a giant in the shmattes (rag) industry in Massachusetts, while Lena took in borders, with a maximum of three at a time. One boarder, Motel, would become their friend for life. As the family grew the Gasses moved several times, probably seeking larger quarters for their brood. Samuel’s naturalization papers, filed on February 6, 1911, list his address as 178 Second Street in Chelsea. By January 1914, the family had moved to 169 Second Street, where they made their home until at least January 1918. 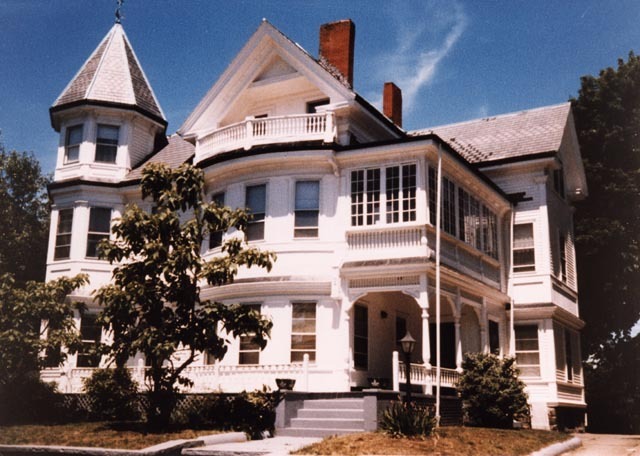 Sometime between the beginning of 1918 and 1920, they moved to 88 Orange Street and occupied the second floor of a three-family house. 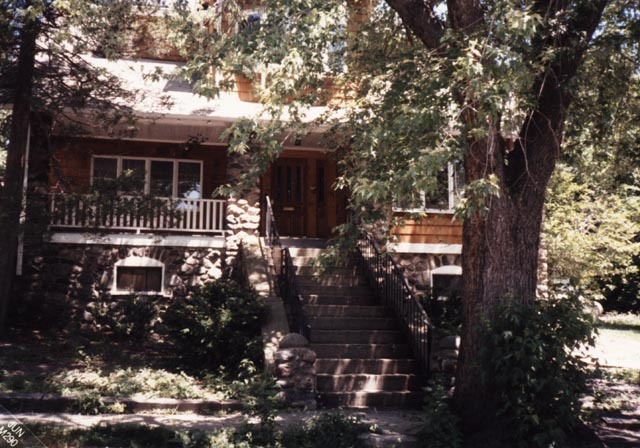 In 1921 or later, Lena’s parents moved into the ground floor apartment. AT SOME POINT BETWEEN the beginning of 1928 and January 1932 (probably 1929). 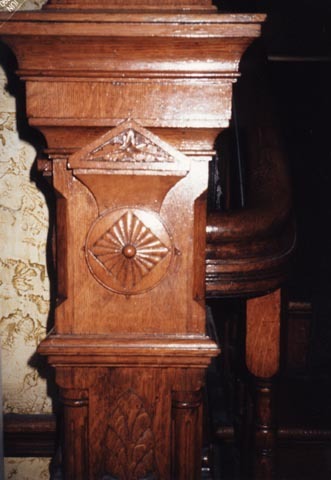 Samuel, now prosperous as an owner of Lion Shoe, moved his family from 88 Orange Street to a huge house at 27 County Road in Chelsea—a three-story home with six bedrooms on the second floor alone. It became a center of extended-family activity. 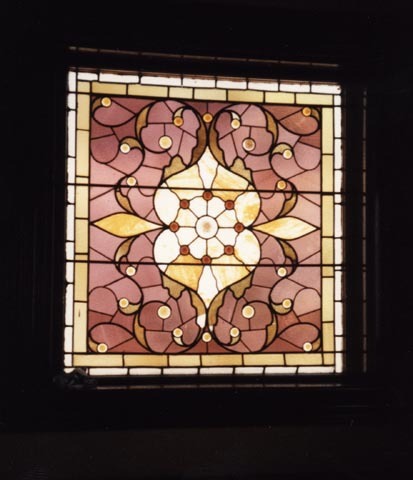 Between Samuel’s two married brothers, Morris and Nathan, and Lena Kessel Gass’s siblings, all of whom were married and lived in or near Chelsea, there were many children. Almost everyone visited at one time or another, especially on the Sabbath and on Sunday afternoons. 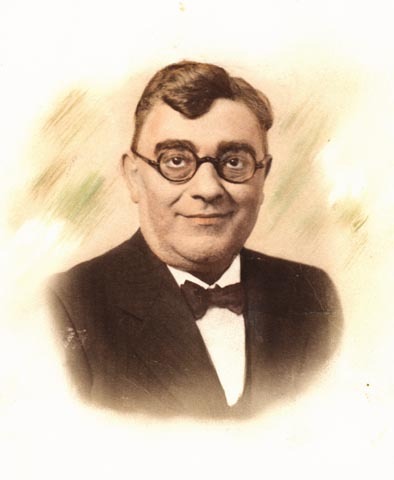 Isaac Razin, Samuel’s partner in the rag business as well as Lena’s uncle, was a regular visitor in the Gass home, especially on Saturday nights. Friends called frequently, too. The one exception was the Gootman family. 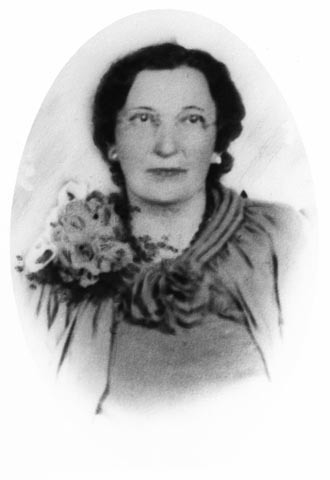 Mary Gootman was Lena’s sister and their husbands had a falling out over the purchase of 27 County Road. Although the men remained business partners, they stopped speaking to each other outside of work and forbad their wives and children from communicating with each other. Read the chapter about the Family Quarrel. 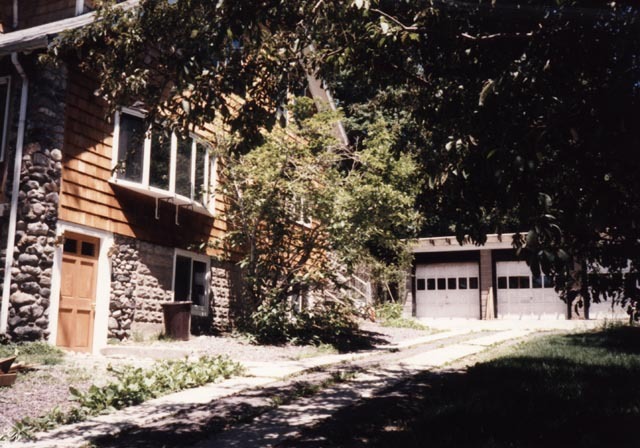 Long after the children of Samuel and Lena Gass were married and had children of their own, the house at 27 County Road remained the center of family activity. Their grand­son, Paul Gass, remembered as a child playing house in the attic with his young cousins. He found 27 County Road a fun place to spend time. 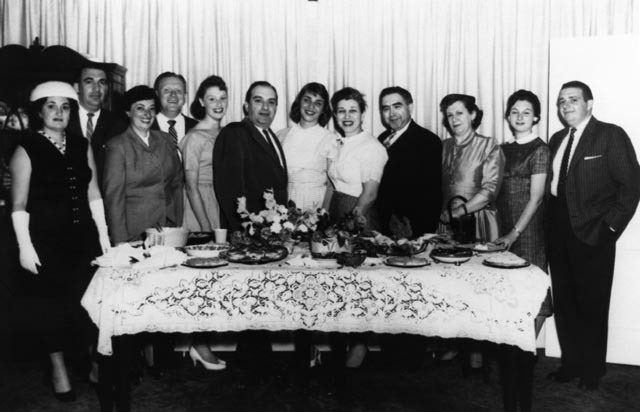 “We celebrated every holiday at my grandparents’ home in Chelsea. My family stayed in the upstairs attic apartment. It was wonderful, and scary. At night, we couldn’t turn on the lights because my Orthodox grandparents observed the tradi­tion of doing no manner of work on holidays, and turning on lights was considered to be work. So there we were in this big, dark house. Paul’s memory of his grandfather’s height was formed when Paul was small. 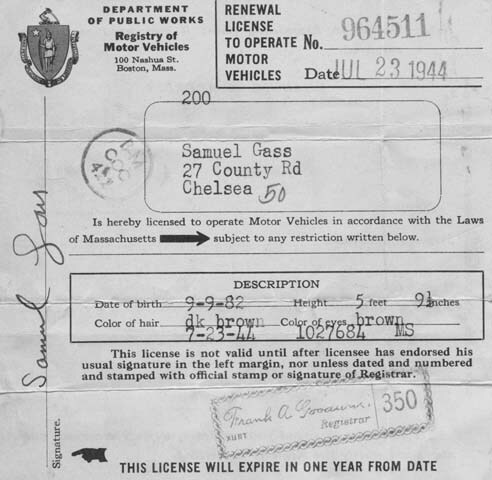 Sam’s 1944 driver’s license, reveals he was not quite as tall as Paul remembers. Samuel Gass stood 5 feet 9-1/2 inches tall. 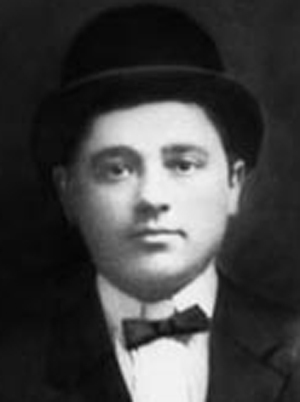 His date of birth was given as September 9, 1882, and he had dark brown hair and brown eyes. 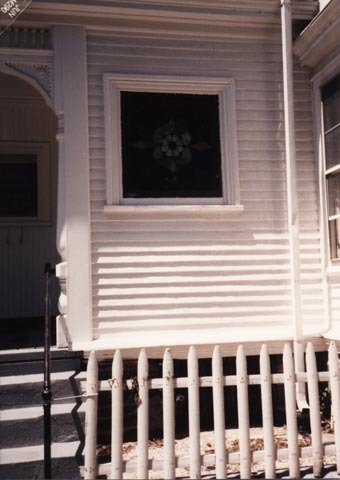 AS THE HEAD OF THE HOUSEHOLD at 27 County Road, Samuel Gass was a dominant and controlling personality. His force of character was perhaps best demonstrated each and every Shabbos. Samuel was a chain smoker who lit one cigarette from another one. Yet every Friday afternoon just before Lena lit the candles to usher in the Sabbath, he took one last puff and put his cigarettes away until Shabbos ended. Week after week, he went cold turkey from an hour before sunset on Friday until after sunset on Saturday. As Samuel was religious, he brought his children up in a strictly Orthodox home. “My father and Shloime were first cousins and there was nothing my father wouldn’t do for him. He would have gotten up in the middle of the night and gone from Lynn to Chelsea to help Shloime. They were extremely close. “In 1928, my parents were living in New Jersey with my younger sister, Marsha, and me. They had no money and Shloime rescued them. Shloime told my father he would make a place for him in Chelsea. So we moved to Carter Street. At some point, Shloime allowed my father to set up and run a cafeteria in the Lion Shoe Company. “Lena really overworked herself because the house was so big. She only had help once a week or every other week and she took care of all the rest, the cook­ing and the cleaning. “I’m almost positive Sam loved her. When Lena took sick, nobody thought Sam was sad about it, but he would retreat to his room. When I walked in he tried to cover up his feelings but I could tell he was upset. When she died, he did the same thing. There was some warmth to him but he didn’t know how to show affection to his wife and children. He was terrific with his grandchildren. He could joke with them. He was a much better grandfather than a father. “Lena was a very unassuming, down-to-earth person. She used to come to my apartment every Friday with a challi and fish, and I used to say to her, Ma, if you wanted to bring the fish up, why didn’t you call me? I’d pick you up. But she never put herself first. “Shortly after Max and I married, we were invited to a wedding. I owned plenty of clothes and I had a black gown with silver trim on the bottom— very, very pretty but Lena wanted me to buy another gown. “I said to her, Gee, Ma, this gown is beautiful, I only wore it once. “She said, Nah, my child, go. “So I went shopping at Filenes’s French shop and I saw this multi-color chiffon gown. It was beautiful. But when the saleslady told me the price I said, Forget it, and came home. Lena visited that day. Did you buy? she asked. I said, No, it’s ridiculous to spend that type of money when I have a perfectly beautiful gown. So what did you see? she asked. I described the gown to her. That same week a package came, and I said to the messenger, It’s not for me, I didn’t order anything. He said, Lady, it’s got your name on the label, it’s paid for, it’s yours.